Plenty of people plan trips around fascinating, inspiring, or just plain weird sites. But what if the enthralling attraction is your hotel itself? While almost every hotel adheres to themes like "simplicity" or "elegance," there are many hotels that incorporate bizarre and beautiful elements into their designs, making guests’ stays a bit more fun. The most recent venture is the new Legoland Hotel at California’s Legoland theme park. While it’s not constructed entirely of Legos, the hotel boasts rooms of varying motifs – such as "adventure," "pirate," and "kingdom" – that are outfitted with decorations and props of their respective themes. Plus, scattered throughout the hotel are elaborate Lego sculptures, blocks to create works of your own, as well as those friendly block-headed Lego people. But, themed hotels aren’t just for beloved childhood artifacts. Here are nine more of our favorites. Many venture to new cities to explore different museums and art projects. 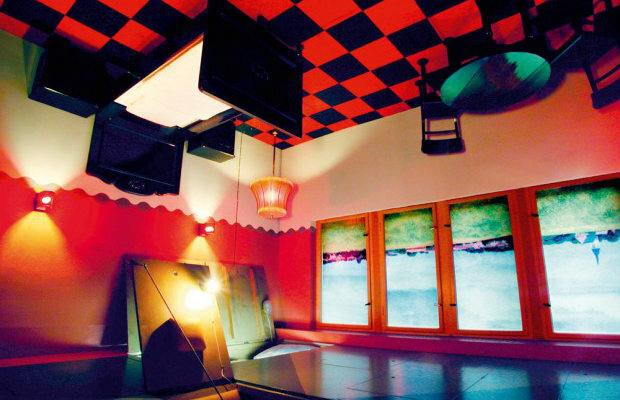 At Propeller Island, an installation by artist Lars Stroschen, guests can occupy audio-visual art projects as easily as they can book a reservation. The hotel is meant to be "a habitable work of art in the heart of Berlin," with each room hosting a unique, sometimes bizarre hallmark. In one room (picture above), the furnishings hang from the ceiling while guests sleep in boxes beneath the floorboards (meant to feel like you’re sleeping on the ceiling). In another, guests can snooze in coffins, choosing to close them if they dare. One of the other highlights is the room of mirrors, a space covered in reflective surfaces to give guests the impression they are in a kaleidoscope. Made from authentic Alaska Railroad cars, this hotel offers panoramic views of the Tanana River, the Alaskan Mountain Range and the city of Fairbanks. It recreates the feeling of riding the rails in style: Each car has been renovated to showcase various historical periods. Book the Golden Nellie car for luxury in the form of gilded ceilings and burgundy velvet drapes, or unwind in The Arlene, a former World War II hospital car. Grab a meal in the dining car to see a mural of the northern lights. 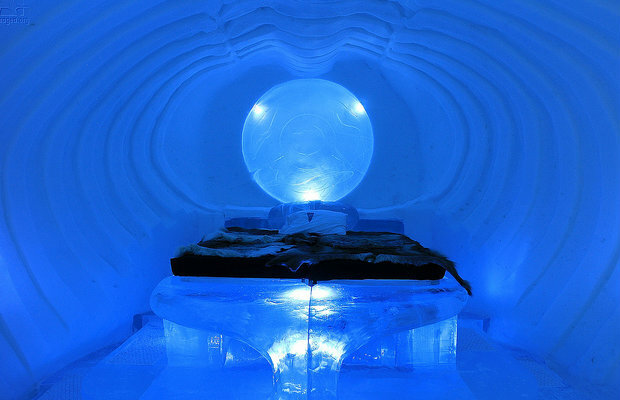 A truly unique experience can be found at Icehotel, the world’s first hotel made out of ice (in case you couldn’t tell from the name). The entire space is built using snow and ice from the Torne River when temperatures drop in November, and is re-constructed each year. But Icehotel has more than just frigid lodgings; it includes a bar, church, main hall, and a reception area. Don’t worry, though, they offer warm accommodations as well for nights when you want to feel your toes. The Ozark mountain range is a geological wonder, and the Beckham Creek Cave Lodge taps directly into the phenomenon. The natural cavern took four years to convert into a hotel, and can be rented by a group of up to 10. Admire the stalactites and rock formations from the comforts of your bed before embarking on a full day of spelunking. Fortunately, dehumidifiers keep quarters moisture free (for the most part), and windows carved into the rock face allow natural light to trickle in. Nobody wanted to be the kid who fell asleep in class, until now. 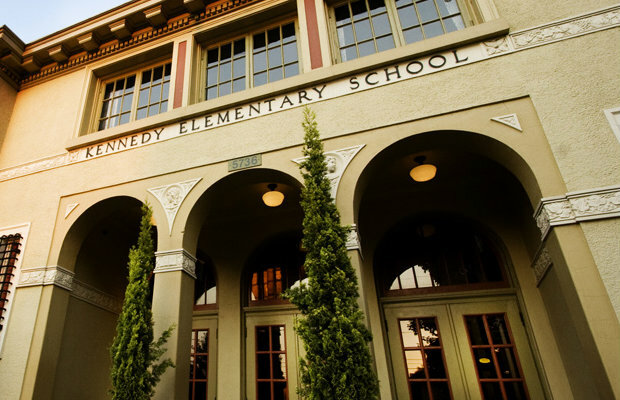 McMenamins Kennedy School opened in 1915, and today houses guests in former classrooms, with some walls still adorned with chalkboards. The auditorium is now a movie theater, the teachers’ lounge is an outdoor courtyard, and the girls’ bathroom is a brewery. Simple, and thankfully not stinky, the rooms at Das Park Hotel are modeled from old sewer pipes. If you’re a minimalist, this is the spot for you: The room contains a bed, storage space, power, and little else. Toilets, showers, a minibar, and café are located in the surrounding public space. The facilities are open May through October and employ a pay-what-you-wish policy, perfect for travelers on a budget. Hop on a plane to spend your vacation in…a plane. 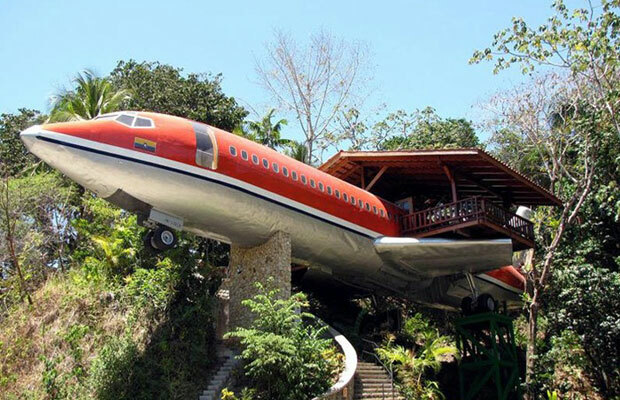 Hotel Costa Verde refurbished a 1965 Boeing 727 after rescuing it from the San Jose Airport. Today it is comfortably perched on a 50-foot pedestal, so guests can get a birds-eye view of the neighboring national park and ocean. The interior of the plane is outfitted with two bedrooms, private baths, and a kitchenette. The outdoor terrace lets visitors catch a glimpse of the region’s famous Squirrel, Howler, and Capuchin monkeys. If you’re a child at heart, book a vacation rental high in South Africa’s canopy. The treehouse resort rests in the foothills of the Outeniqua mountain range, near the Western Cape. The spot provides a variety of houses for all types of travel groups: tree houses can serve as a romantic retreat for newlyweds, or a larger set for a family. 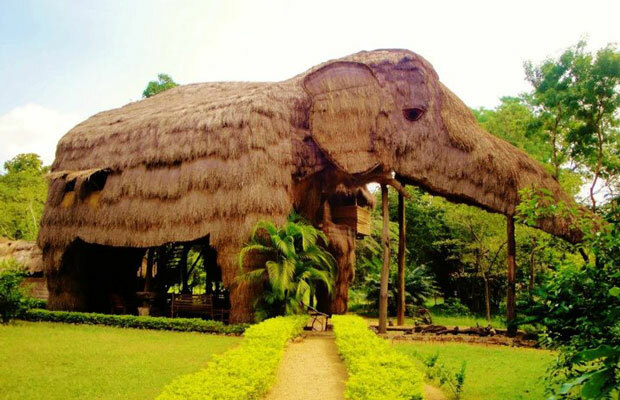 Nestled near the edge of Sri Lanka’s premiere wildlife sanctuary, the Kumbuk River Resort allows guests to stay in the belly of the beast (quite literally) – a 40-foot elephant sculpture made of branches and grass. The structure is so lightweight it often sways on windy nights. The Elephant Villa has two airy bedrooms, a lounge area, and electricity. Of course, if you want to get the most out of this eco-lodge, you can request solar lamps instead.